In architecture, neoclassicism was the dominant style in Europe during 1750s-1850s, marked by the imitation of Greco-Roman forms. It was used in a range of architectural forms, including churches, arches, temples, houses, terraces, garden monuments and interior designs. Neoclassical architecture became an international style; each country having distinct characteristics which reflected the architecture of ancient Greece and Rome. The prefix ‘neo’ means new. In England there had been an absence of a strong Renaissance Classicism, which enabled England to embrace neoclassicism more quickly. The English were the most adventurous and painstaking exponents of early field archaeology. They were the first to scientifically survey the Acropolis (1751), Palmyra (1753), Baalbek (1757), Split (1757) and Ionia (1764-69). The most important neoclassical architects in England were Sir William Chambers and Robert Adam and they were the first to evolve a style that evoked the richness of antiquity. Chambers designed many public buildings, notably Somerset House (1780) in London. He was a close adherent to the Palladian tradition and designed most of his buildings in strictly Roman classical form, with fine proportions and exacting excellence of detail and finish. Adam became an influential interior designer and furniture designer as well as a leading architect. He made Roman designs fashionable in such houses as Osterley Park House (1763-1780) in London; no two houses by Adam are alike. Adam drew from sources such as Roman imperial palaces or baths, Greek temples of Athens and Asia Minor, villas from Herculaneum following no rigid rule system. Pietro Bianchi, an Italian architect, designed one of the major neoclassical buildings of the early 1800s, the Church of San Francesco de Paola in Naples. The design of the church is based on that of the Pantheon, an ancient Roman temple. Giovanni Battista Piranesi (1720-1778) – a Venetian engineer and architect impacted on Italian design through the visual force of his etchings and engravings. In France, neoclassicism was known as the ‘Louis XVI’ or ‘Louis Seize’ style and developed differently. Architects were interested in the primary geometric solids of the cube, sphere and pyramid and the logical basis for architectural expression. They proposed entire buildings dominated by simple solid geometrics. 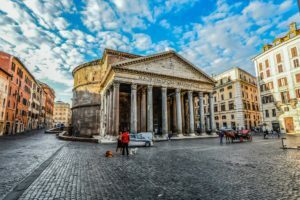 One of the most famous buildings is the Pantheon (1757-1790) designed by Jacques Soufflot. It was originally a church named after Sainted Genevieve. Jacques Soufflot’s (1713-80) Pantheon Paris; introduced the first revelation of Roman grandeur into France. 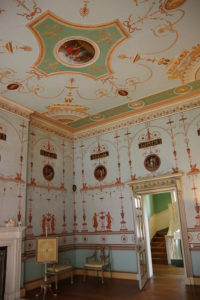 The walls were severely blank, except for a repeated garland motif in the attic level. The colonnaded dome rises above a Greek-cross plan, and both vaults and dome rest upon an interior grid of freestanding Corinthian columns. The whole effects inside and out is Roman. Other leading French Neoclassicists were Etienne-Louis Boullee (1728-1799) and Claude-Nicholas Ledoux (1736-1806), who attempted to reconcile the traditional elements of French classicism with the new spirit of the antique. Among these were the Chateau de Benouville, Calvados and the Hotel de Montmoreney, Paris both of which feature Ionic colonnades with straight entablatures. Boullee is best remembered for a design for a monument to Isaac Newton, an enormous sphere, set into a double ring base, which demonstrates the desire to exploit the use of massive geometric figures. It was in France that the greatest numbers of neoclassical monuments were constructed. In the United States, neoclassical architecture became known as the Federation Style. The leading architects were Benjamin Latrobe, Charles Bulfinch and Thomas Jefferson. Latrobe for his designs in Washington, D.C, Bulfinch’s most important projects included the statehouse of Maine and Massachusetts. Thomas Jefferson believed that a classical manner was appropriate for public buildings. He used the complete Roman temple form as his model for the Virginia statehouse at Richmond. “Jefferson’s choice was based on his admiration he felt for the original both as an embodiment of the pure beauty of antiquity and as a symbol of idealized Roman Republic government” (De La Croix H & Tansey R 1980; 707). We hope that you are enjoying reading about Neoclassical architecture and it’s history. Next week, in Part 2 of our 3 part blog, we go into Neoclassical Design Methodology. In the meantime, take a look at previous blogs written about Art Nouveau or Brutalist architecture.